Lyme Disease is mostly known for the bulls-eye rash, which indicates that the infection is spreading. It is a common tick-borne illness transmitted by the bite of an infected black-legged tick, known as a deer tick. 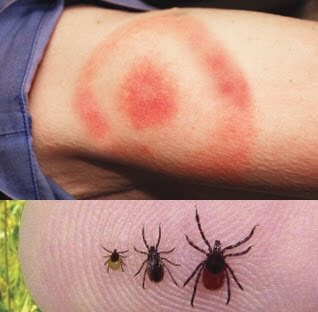 It is a bacterial infection and symptoms appear after 3 to 30 days of deer tick bite. If you have spend some time in grassy or forest area then you are more prone to such bite and infection. Timely recognition of symptoms, appear in stages and grow severe with time, can get you an early treatment. Lyme disease is spread by an infected deer tick, which are usually very small in size. They must remain attached to your skin for 36 to 48 hours to transmit the bacteria into your body through the bite. If you find an attached tick in swollen condition, then most probably it has done its job and transmitted the bacteria into your body. The bacteria then enters your blood stream. There are four main species of bacteria responsible for lyme disease. As we have told earlier that it takes 3 to 30 days for infection to spread its symptoms, which occur in stages. So if you have noticed a tick bite then keep examining yourself for symptoms mentioned below. If you find even a few of them, then contact your doctor as soon as possible. Rash: It usually appears at the site of bite in the shape of a bulls-eye. Usually it neither pains nor itches, so you need to examine it yourself. The bulls-eye can expand over days may enlarge upto 12 inches. Joint pain and swelling can occur in knees and then spread to other joints. Other red rashes, known as Erythema migrans can also appear at other parts of body. Multiple bulls-eye rashes diffusing together. Neurological problems like temporary paralysis, Numbness or weakness in limbs, neuropathy and impaired memory. Meningitis : Inflammation of membranes surrounding your brain. Severe symptoms may take months to years to develop. It is advised to begin the treatment as soon as you notice any early symptom. Diagnosis of lyme disease is hard as its symptoms are also found in some other common diseases. ELISA Test: Enzyme-linked immunosorbent assay (ELISA) test detects the antibodies to B. burgdorferi. It is a blood test which works only few weeks after infection. Western blot test: If ELISA Test comes positive then Western blot test is done to find other antibodies to several proteins of B. burgdorferi. Oral antibiotics can be used to treat early symptoms of lyme disease. Amoxicillin, doxycycline and cefuroxime are usually prescribed as 14 to 21 day course. Intravenous antibiotics are recommended if the disease is spread to central nervous system, but this treatment is also known for side effects. Beware : Some alternative treatment practitioners use bismacine injection, which is not permissible according to FDA, as it can lead to heart and kidney failure. If you are spending time in woods then it better to keep your full body covered. Keep checking your arms and legs for any possible tick bite. If you find any tick attached to skin, remove it as soon as possible to prevent the infection. Never think that you are immune, as you can get lyme disease more than once. How to remove the tick ? Removing the tick with right technique can also save you from possible infection. Grasp the tick gently at its head or mouth and try not to crush or squeeze it. Then pull it carefully to remove the entire tick and then dispose it of. Apply some antiseptic at the site of bite to save yourself from possible infection.